complementary DNA (cDNA) (copy DNA (cDNA)) synthetic DNA transcribed from a specific RNA through the reaction of the enzyme reverse transcriptase. Abbreviation for deoxyribonucleic acid. For terms bearing this abbreviation, see subentries under deoxyribonucleic acid. complementary DNA (cDNA), copy DNA DNA transcribed from a specific RNA through the action of the enzyme reverse transcriptase. mitochondrial DNA (mtDNA) the DNA of the mitochondrial chromosome, existing in several thousand copies per cell and inherited exclusively from the mother. nuclear DNA (nDNA) the DNA of the chromosomes found in the nucleus of a eukaryotic cell. recombinant DNA DNA artificially constructed by insertion of foreign DNA into the DNA of an appropriate organism so that the foreign DNA is replicated along with the host DNA. repetitive DNA nucleotide sequences occurring multiply within a genome; it is characteristic of eukaryotes and some is satellite DNA while other sequences encode genes for ribosomal RNA and histones. satellite DNA short, highly repeated eukaryotic DNA sequences, usually clustered in heterochromatin and generally not transcribed. single copy DNA (scDNA) nucleotide sequences present once in the haploid genome, as are most of those encoding polypeptides in the eukaryotic genome. spacer DNA the nucleotide sequences occurring between genes. Abbrev. for deoxyribonucleic acid. The very long molecule that winds up to form a CHROMOSOME and that contains the complete code for the automatic construction of the body. The molecule has a double helix skeleton of alternating sugars (deoxyribose) and phosphates. Between the two helices, lying like rungs in a ladder, are a succession of linked pairs of the four bases adenine, thymine, guanine and cytosine. The molecules of adenine and guanine are larger than thymine and cytosine and so, to keep the rungs of equal length, adenine links only with thymine and guanine only with cytosine. This arrangement allows automatic replication of the molecule. The sequence of bases along the molecule, taken in groups of three (codons), is the genetic code. Each CODON specifies a particular amino acid to be selected, and the sequence of these, in the polypeptides formed, determines the nature of the protein (usually an ENZYME) synthesized. Polypeptide formation occurs indirectly by way of MESSENGER RNA and TRANSFER RNA. Periodicity of DNA is defined as the number of base pairs per turn of the double helix. Fig. 136 DNA. The ‘double helix’ shape produced by coiling. Fig. 135 DNA. Complementary base pairing. a complex NUCLEIC ACID molecule found in the chromosomes of almost all organisms, which acts as the primary genetical material, controlling the structure of proteins and hence influencing all enzyme-driven reactions. structure. DNA is a polymer of deoxyribonucleotides. The model proposed by WATSON and CRICK in 1953 has now become universally accepted for double-stranded DNA. The DNA is considered to consist of two POLYNUCLEOTIDE CHAINS joined together by hydrogen bonds between NUCLEOTIDE BASES, with COMPLEMENTARY BASE PAIRING between specific bases ensuring a parallel-sided, stable structure: ADENINE pairing with THYMINE (2H bonds) and CYTOSINE with GUANINE (3H bonds). The two polynucleotide chains each have an opposite polarity due to the way the phosphates are attached to the sugar groups by 3'- 5' PHOSPHODIESTER BONDS. 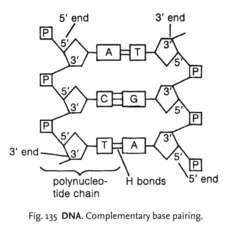 DNA can exist in a number of configurations, of which B-DNA is the predominant form. In this form the molecule is twisted into a right-handed double helix, with a complete turn every tenth base. replication (see SEMICONSERVATIVE REPLICATION MODEL). Replication is initiated at the ORIGIN OF REPLICATION. DNA HELICASE enzymes unwind the double-stranded DNA and each parental strand acts as a TEMPLATE for new DNA synthesis. 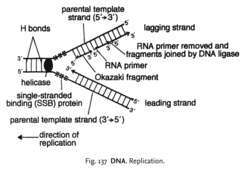 The anti-parallel nature of the double-stranded DNA molecule affects the replication process. The DNA POLYMERASES involved in replication can only add NUCLEOTIDES to the 3'- OH group of a polynucleotide chain, that is, a DNA strand can only be synthesized in the 5'- 3' direction requiring a template running 3'-" 5'. Thus the two newly synthesized strands must grow in different directions. One daughter strand (the leading strand) is synthesized continuously in the 5'- 3' direction. The other daughter strand (the lagging strand) is synthesized discontinuously in fragments (called Okazaki fragments) that have been synthesized in the normal 5'- 3' direction, but the strand grows overall in the 3'-" 5' direction. These fragments are afterwards joined to make a continuous strand. The region in which replication occurs is called the replication fork. In E. coli, replication occurs as follows: the DNA unwinds, SSB protein is laid down on the single strands to stabilize them and to prevent rewinding. An RNA PRIMER initiates DNA synthesis on the leading strand. RNA primers initiate synthesis of each fragment on the lagging strand. These primers are later removed and the gaps left are filled in by the activity of a DNA polymerase. DNA LIGASE then joins the fragments together to form a complete strand. In eukaryotes, DNA replication occurs in the ‘S’ phase of the CELL CYCLE prior to nuclear division. location. DNA is found in all chromosomes except those of certain viruses (such as tobacco mosaic virus, TMV), where the heritable material is RNA. In PROKARYOTES, DNA is generally in the form of a single coiled molecule in a continuous loop (see NUCLEOID and may also occur as extrachromosomal material in the cytoplasm. In EUKARYOTES the DNA is also highly coiled but is complexed with basic and acidic proteins. There is probably only one very long DNA molecule per chromosome. DNA is also found in CHLOROPLASTS and MITOCHONDRIA of eukaryote cytoplasm (see CYTOPLASMIC INHERITANCE). DNA as a genetic material. There are several pieces of evidence to suggest the role of DNA in inheritance: (i) TRANSFORMATION experiments with Streptococcus (Diplococcus) pneumoniae in 1928, by F. GRIFFITH; (ii) the identification of the ‘transforming principle’ as DNA by AVERY MacLeod and McCarty in 1944; (iii) the fact that the wavelength of ultraviolet light which causes most mutations in various prokaryotes and eukaryotes matches the ABSORPTION SPECTRUM of nucleic acids (260 nm); (iv) HERSHEY and Chase's experiment with labelled BACTERIOPHAGE. DNA has several features which make it an ideal genetic material: great stability (see structure above); accurate replication so that all cells contain an identical copy of information; four nucleotide bases to provide storage of coded information (see GENETIC CODE); it is capable of mutation by altering the base sequence; it may be broken and rejoined to form new genetic combinations (see RECOMBINATION); stored information can be accurately ‘read’ by other cell molecules (see TRANSCRIPTION). The abbreviation for "deoxyribonucleic acid," the primary carrier of genetic information found in the chromosomes of almost all organisms. The entwined double structure allows the chromosomes to be copied exactly during cell division. A type of nucleic acid that constitutes the molecular basis of heredity. It is found principally in the nucleus of all cells where it forms part of the chromosome, or in the cytoplasm of cells lacking a nucleus, such as bacteria. It acts as the carrier of genetic information containing the instructions (code) to make proteins. It consists of two single chains of nucleotides, which are twisted round each other to form a double helix or spiral. The nucleotides contain sugar (deoxyribose), phosphate and the bases (adenine, cytosine, guanine and thymine). The two strands of DNA are held together by hydrogen bonds located between specific pairs of bases (adenine to thymine and cytosine to guanine). The sequence of bases and consequently gene sequence is sometimes altered, causing mutation. Assessment of DNA has found many applications, including forensic science to help identify a perpetrator (a process called genetic fingerprinting), to establish family relationships or the history of a particular population (phylogenetics). See chromosome; gene; inheritance; mutation. n an acronym for deoxyribonucleic acid. A type of nucleic acid that contains genetic instructions for the development of cellular life forms. Capable of replicating itself and of producing another type of nucleic acid known as RNA. n the DNA specific to a bacterial strain. are of two general types, histone proteins which are part of the unit structure of chromosomes called nucleosomes and nonhistone proteins which are present in small amounts and include regulatory proteins. a DNA molecule that is a closed-ring structure, found in mitochondria, prokaryote chromosomes, plasmids, and certain viruses. the first of two kinetically distinct steps required for RNA polymerase to initiate transcription in which the RNA polymerase holoenzyme binds electrostatically to the promoter DNA. a DNA molecule which has been inserted into a cloning vector. a DNA copy of mRNA which contains only regulatory and coding sequences, i.e. introns have been removed. mRNA is copied into double-stranded DNA using reverse transcriptase; the cDNA can then be cloned and amplified and introduced into an expression vector (plasmid or phage) and its protein product produced in either bacterial, yeast, insect or mammalian cells. Called also cDNA. methods for labeling DNA with radioisotopes or other detectable marker molecules at the ends using the terminal transferase 3′-labeling or polynucleotide kinase for 5′-labeling. that present in a cell as extra chromosomal; exemplified by plasmids of prokaryotic cells. See plasmid. the DNA that has been introduced into a host by cloning. see restriction fragment length polymorphism. enzymes involved in the excision-repair mechanisms for DNA. duplex DNA with each strand from a different origin. a collection of cloned DNA molecules from a genome. an enzyme that seals nicks in the DNA helix, joins Okazaki fragments together during DNA replication and is essential in recombinant DNA technology for DNA cloning. an ordered set of thousands of different oligonucleotides immobilized on a microscope slide or other solid surface used for the detection of cognate nucleotide sequences such as the pattern of gene expression in a particular cell population by hybridization with fluorescently labeled cDNA prepared from total mRNA isolated from the cells. a sequence present in the variable locations on the chromosome. Called also jumping genes. See also retrotransposon and transposable genetic elements. a local opening of about 10 base pairs formed at the transcription initiation site following the electrostatic binding of RNA polymerase holoenzyme to the promoter region. of Escherichia coli; has three distinct enzymatic activities: (a) a 5′ to 3′ polymerase activity which, under the direction of a template DNA, catalyzes the addition of mononucleotide units, produced from deoxynucleoside 5′-triphosphates, to the 3′-hydroxyl terminus of a primer chain; (b) a 5′ to 3′ exonuclease active only on duplex DNA; (c) a 3′ to 5′ exonuclease primarily active on single-stranded DNA which can selectively remove mismatched terminal nucleotides, thus carrying out a proofreading function. Additionally it catalyzes both the pyrophosphorolysis of DNA, a reaction which is the reverse of polymerization, and pyrophosphate exchange which represents a repetitive sequence of nucleotide addition and pyrophosphorolysis. a series of enzymatic mechanisms whereby errors or damage to one of the two DNA strands are removed by excision and replaced by correct nucleotides using the undamaged strand as template. The mechanisms include removal of lesions of depurination and DNA glycosylases which recognize altered bases. includes (a) satellite DNA and so-called (b) interspersed repeated DNA sequences. The latter are interspread throughout the chromosomes in hundreds of thousands of individual copies, each about 300 nucleotides long; they are, unlike satellite DNA, transcribed. serially repeated DNA sequences of one or a few nucleotides with a repeat length of up to 250 nucleotides that are not transcribed and commonly located in the heterochromatin associated with the centrometric regions of chromosomes. a mobile DNA element that appears to have no function except to replicate itself. Part of junk DNA. determining the order of nucleotides in DNA from which amino acid in a polypeptide chain can be predicted. the fraction of DNA that contains most of the protein-coding genes and reassociates most slowly. produced when double-stranded DNA is denatured or found naturally in some viruses. single-copy DNA sequences which do not encode proteins or functional RNA molecules. the double helix is itself twisted. a twisted structure formed by circular DNA molecules. See also supercoiled DNA (above). DNA sequences that occur only once in the haploid genome. contain a single molecule of DNA that is either double or single stranded. Parvoviruses and circoviruses are single stranded, hepadnaviruses are partially double stranded and all others are double stranded. DNA virus families are: Poxviridae, Asfarviridae,Herpesviridae, Adenoviridae, Papovaviridae, Parvoviridae, Circoviridae, and Hepadnaviridae. an alternative structural form of DNA which differs from the more commonly occurring B- and related A-form in that the helix is left handed compared with the right hand helixes of B- and A-forms. Z is for zig-zag. The functional significance of Z-DNA is unknown.